Today I have a card for you which uses a Christmas stamp set to create a non Christmas card. 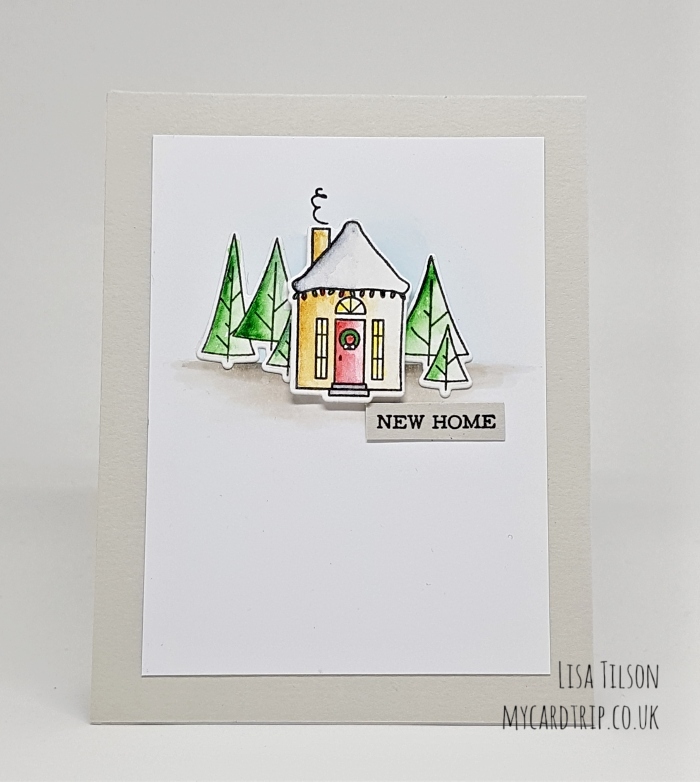 This card came about as I sat down to make a New Home card for my Mum and Dad and discovered I didn’t really have any stamp sets with buildings/houses in them! Shock, horror! 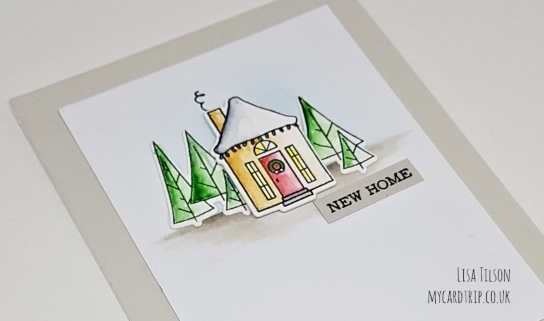 But what I did have was this gorgeous little Holiday Houses set from WPlus9 that I hadn’t yet used so I thought I would use it for a new home card. The only thing that really gives it away that it’s a Christmas set is the tiny wreath on the door, and the lights along the edge of the roof. But I don’t think my Mum and Dad will mind too much, and it is winter after all. I began by stamping all my images onto Tim Holtz Distress Watercolor Cardstock using Versafine Onyx Black ink as it’s a waterproof ink. I watercoloured them with Daniel Smith Extra Fine Watercolors, left them to dry and then die cut them with the coordinating dies. Next I die cut a panel of Neenah cardstock with my Hero Arts Rectangle Infinity dies and positioned my pieces as I wanted them, marked the area for the “ground and then coloured it with my Copics. I also blended some Tumbled Glass Distress Ink above the ground, so there is a light blue sky behind. The tree images were adhered with a wet adhesive and the house was popped up with foam tape. I stamped my sentiment from Clearly Besotted’s Miniature Type set onto Fog cardstock using Versafine Onyx Black ink and trimmed it to size. This was then stuck down with wet adhesive. I like the definition of the sentiment on some cardstock rather than just direct to the white panel. The finished panel was added onto an A2 top folding Fog cardstock base. And this card is now ready to take with me when I go and help them settle in next week. Thank you for stopping by. I wish you all a wonderful week. Happy crafting! Adorable little scene, my daughter moved into her first ‘ grown up ‘ home last year & I ran into the same hitch, but ended up making a scene with a for sale board & a email so the sign read new home just by the shell. How do we not have these sets, can you put a word in for a good fun set please ? it’s a lovely card!! another option would have been to not ink the lights or the wreath when you were stamping. that way, they wouldn’t have been there – tada!! just a cozy home. of course it’s just gorgeous the way it is!! because it comes from you and your heart. It’s so very beautiful, such a cozy scene to welcome your mum and dad into their new home. Great card. I like the fact that you used what stamps you have. It look great.